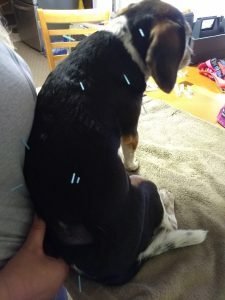 A Beagle presented to the clinic for pain involving the cervical spine. Acupuncture was initiated along with pain management including gabapentin, methocarbamol, prednisone and cage rest. After the first two weeks, patient showed significant improvement in pain score and general mobility. Over a three-month treatment course, patient continued to improve throughout treatment sessions and is currently on a monthly treatment plan. “Sadie” a 5-year-old female spayed Beagle presented on 5/5/2018 for worsening pain involving her cervical spine. Owner reported previous episode approximately 18 months previous that was treated with rest and resolved. She had been prescribed Previcox 57 mg PO SID previously in the week, without improvement in clinical signs. Sadie also has a history of atopy and yeast otitis treated with topicals and short courses of prednisone as needed. No known history of trauma, she does have a German Shorthair Pointer as a housemate and they play very rough. She is current on vaccinations. Her episodes of neck pain include twisting her head laterally and curling into a ball. She walks with a ventral head and neck position and resists lifting head dorsally and to either side. 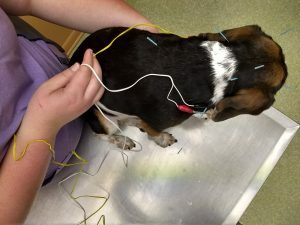 Sadie presented for acupuncture treatment on 5/11/2018. Her current medications included Prednisone 5 mg PO BID, Fentanyl 25 mcg transdermal patch applied on 5/8 and Methocarbamol 500 mg PO BID. TPR within normal limits, her head and neck movement were limited and guarded, her most comfortable posture was with head and shoulders hunched. She would wag her tail and have facial expression when spoken to. Cranial nerves appear normal, no muscle atrophy of masseter muscles, normal palpebral response, no facial drooping. Proprioception was normal, ambulation normal, no knuckling, or hesitation to place limbs. No crossed extensor reflex present. Using treats, all motion of neck was limited, left to right, right to left, dorsal to ventral. Owner reports reduced appetite, will only eat canned food elevated, normal to increased water consumption (attributed to Prednisone administration). Radiographs of cervical spine performed on 5/8 within normal limits. No MRI or CT performed. Myofascial exam found the omotransversarius muscle extremely tight and painful with even gentle palpation eliciting a flinching response. Local trigger points along the cervical nerve roots. Deltoids were also responsive to palpation. According to neurologists, the most likely diagnosis is a disc extrusion in the cervical spine. Beagle Pain syndrome is attributed to a sterile meningitis, and those patients typically have a fever associated with their symptoms and respond quickly to steroid administration. One neurologist on VIN stated that 65% of dogs with cervical disc extrusion will get better with steroids, pain management, strict cage rest, and time. Sadie’s lack of peripheral neurologic signs reduces the likelihood of compressive myelopathy. Her radiographs did not correlate with neoplastic signs or degenerative joint disease. Central: GV14 and Bai Hui to stimulate parasympathetic input reducing anxiety and pain wind-up. GV 14 also has the local effects to the caudal cervical spine and cranial thoracic spine where Sadie’s problems lie. Peripheral: SI 3 and BL 60 to stimulate ulnar nerve and fibular nerve respectively to reduce spinal pain. LU 7 for stimulation of superficial radial nerve and the cervical spinal nerve roots. ANS: GV 20 and Bai Hui to stimulate the nucleus tractus solitarius via the trigeminal nerve and the parasympathetic nervous system. Myofascial component: BL 10 and local cervical trigger points, GB 21 bilaterally to release cervical trigger points and stimulate the Golgi tendon organs to reduce muscle tension in the omotransversarius and brachiocephalicus. 5/11/2018: Seirin 0.16 x 30 mm: GV 14, Bai Hui, BL 10 bilaterally, GV 20, GB 21 bilaterally, LU 7 bilaterally, local cervical points all dry needling. Attempted points on distal limb dog highly resented them. The points selected to stimulate parasympathetic tone, relieve myofascial tension, and stimulate the Golgi tendon organs. Needles were left in place for 15 minutes. Sadie did not relax at all during this session. 5/14/2018: Seirin 0.20 x 30 mm: GV 20, BL 10 bilaterally, LU 7 bilaterally, GV 14, Bai Hui, GB 21 bilaterally, CV 22, local cervical points. Dry needles except for local cervical points were electronically stimulated with an ITO unit at 5 Hz for 10 minutes. Points were chosen based on parasympathetic stimulation and muscle tension in the neck. Sadie would not allow even massage on her distal limbs. 5/16/2018: Seirin 0.20 x 30 mm: GV 20, Bai Hui, GV 14, CV 22, BL 10 bilaterally, GB 21 bilaterally, LU 7 bilaterally, TH 21 bilaterally, and local cervical trigger points. E-stim with the ITO unit on local cervical points 5 Hz, any increase in e-stim appeared to cause pain. 5/18/2018: Seirin 0.20 x 30 mm: GV 20, BL 10 bilaterally, BL 11 bilaterally, GB 21 bilaterally, Bai Hui, GV 14. E-stim on BL 10 to BL 11 5 Hz for 10 minutes, Sadie became agitated and relaxed after e-stim was removed. 5/21/2018: Seirin 0.20 x 30 mm: GV 14, BL 10 bilaterally, GB 21 bilaterally, BL 11 bilaterally. No e-stim performed, Sadie tried to bite when machine was started. 5/24/2018: Seirin 0.20 x 30 mm: BL 10 bilaterally, GB 21 bilaterally, BL 11 bilaterally, Bai Hui, GV 14; E-stim leads from BL 10 to GB 21 crossed across midline at 5 hz for 10 minutes, Sadie tolerated this session of E-stim. 5/29/2018: Seirin 0.20 x 30 mm: BL 10 bilaterally, Bai Hui, GV 14; BL 11 bilaterally, GB 21 x 2; did the same (5 hz) crossed e-stim leads as 5/24 for 5 minutes. 15 minutes total needle time. 6/1/2018: Seirin 0.20 x 30 mm: BL 10 bilaterally, GB 21 bilaterally, BL 11 bilaterally, Bai Hui, GV 14; 5 hz estim for five minutes same connection as above before needles fell out; 15 minutes dry needle time. 7/25/2018: Seirin 0.23 30 mm: GV 14, Bai Hui, BL 10 bilaterally, BL 11 bilaterally, GB 21 bilaterally. 15 minutes dry needles. Sadie responded well to medical treatment in conjunction with acupuncture treatment. The owner reported that she slept well after her treatments with less anxiety as well as less pain. The attached videos show her progress as well improving from a hunched position when walking to freely roaming the yard with full range of motion of her neck. Electrical stimulation seemed to be too much after the initial two weeks, and dry needling appeared to give improvement. This was one of my first cases as a newly minted medical acupuncturist. Sadie proved to me not to second guess the efficacy of acupuncture for pain associated with the spine. Her signs remained static for the first few sessions, which was difficult for me to interpret. Her owner was also very committed to acupuncture and persisted with it, even when I was concerned that we should pursue neurology consult. In speaking with the neurology department at CSU, it was recommended that Sadie have an MRI with likely surgery, based on my history and clinical exam. I believe that Sadie may have ended up with what, in retrospect, would have been unnecessary surgery. The following reference in the Journal of Animal Science discusses a retrospective analysis of treating cervical pain in dogs J Vet Sci. 2016 Sep 30;17(3):337-45. doi: 10.4142/jvs.2016.17.3.337. Retrospective study of the clinical effects of acupuncture on cervical neurological diseases in dogs. Liu CM1, Chang FC2, Lin CT3. These dogs appeared to have varying signs including paraplegia. Luckily, Sadie did not progress to that level of disability. In my practice I do not have an easily accessible referral for neurology, the closest is CSU, approximately 400 miles away. Sadie showed me that acupuncture is an effective way to help these patients.